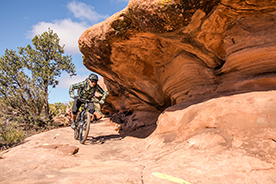 To most mountain bikers, Moab needs little introduction. 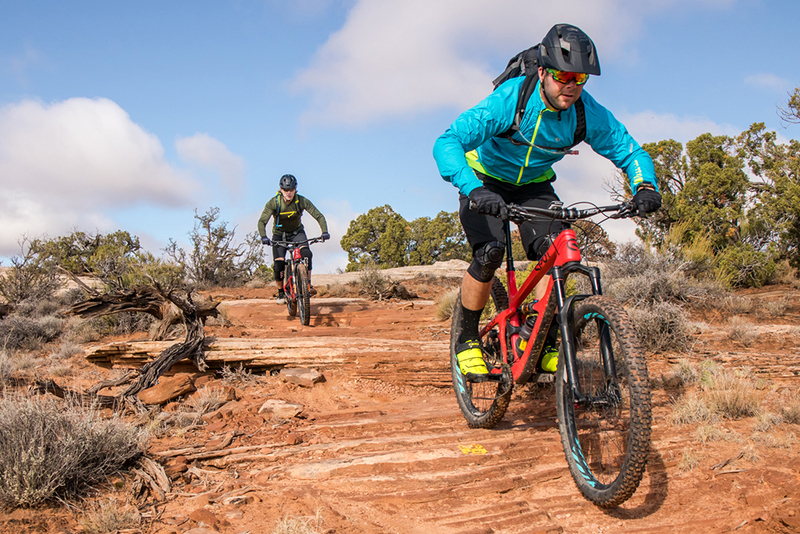 The southeastern Utah town has become an epicenter for the mountain bike world thanks to mile after mile of legendary trail. Come explore these trails with us and knock Moab of your mtb bucket list! 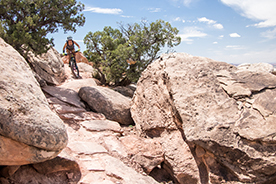 Our guided Moab mountain bike trip package will take advantage of all of these great trail areas for the ultimate Moab mountain bike trip. 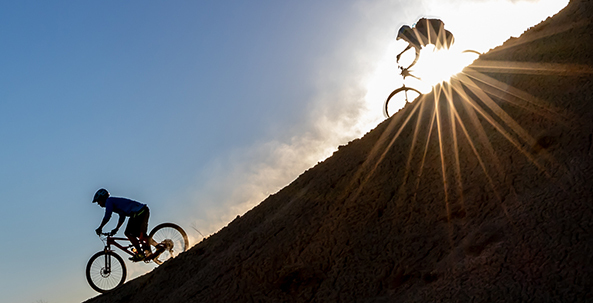 While its certainly possible to explore Moab on your own, this trip led by local experts Chasing Epic Mountain Bike Adventures, will help you maximize your time in one of mountain biking's most legendary locations. This means, you can look up and enjoy the riding, rather than burying your head in a map wondering if you're doing it right. Maximize your time in the saddle and ride with us on this great trip! The riding in Moab takes some getting used to, which is why we'll head over to the Navajo Rocks area to ease you into it. Don't get us wrong, these trails are still technical and will push your limits, but there's always a "B line" to make sure we can ride all the good stuff. Ride: 15 miles, 1,200 feet climbing. Often overlooked because it's just outside of town, the Klondike Bluffs and North Klondike area is one of our favorites. 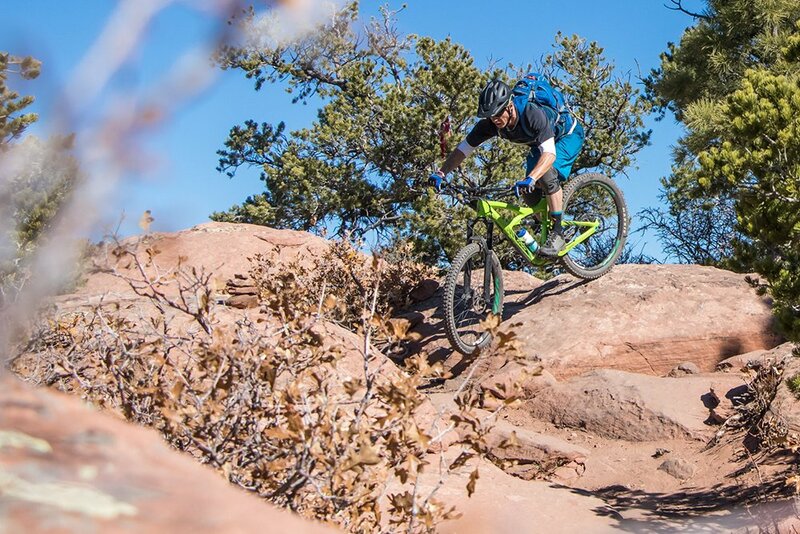 These trails will push your limits and get you accustomed to "Moab tech". An amazing combination of slickrock, chunk, and flow, these trails sit right on the doorstep of Arches Nat'l Park and have the best of both worlds. Ride: 20 miles, 2,000 feet climbing. This is it: The Whole Enchilada. Yep, today we'll shuttle up to over 10,000 feet where we'll begin with a stiff climb up to Burro Pass at 11,200 feet. 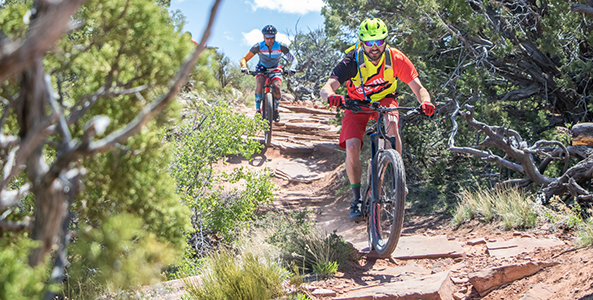 From there, it's a whopping 8,000 feet of descending down to the valley floor and back into Moab; we'll experience so many different types of riding, you'll have trouble picking your favorite. It's going to be a long day, so make sure to eat a little bit extra for breakfast! Ride: 34 miles, 1,500 feet climbing. Today we'll head west from town to tackle Hymasa and Captain Ahab, both relatively new trails to the area but no stranger to fun. The climb up Hymasa is a fun technical workout where you'll be overwhelmed by the views into the valley, and the challenge you're overcoming. 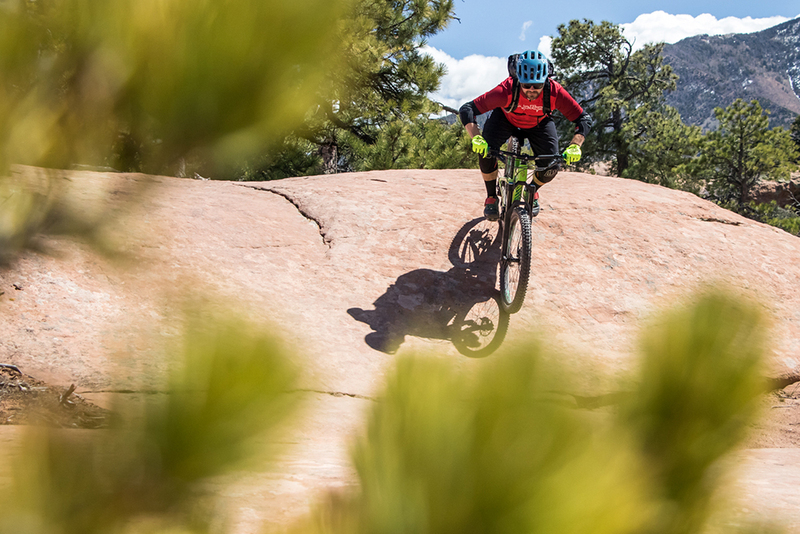 The descent down Ahab is one of the best in the area, with lots of rideable tech features that will leave you smiling once we're done around lunchtime. Ride: 11 miles, 1,800 feet climbing. 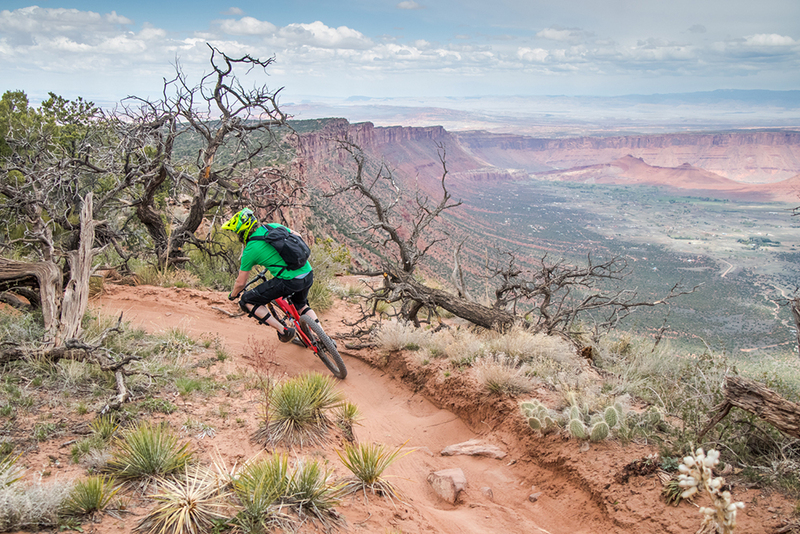 Get ready to ride some of the most amazing mountain bike trails in the world on this Moab mountain biking trip package. 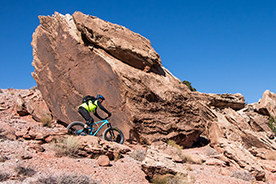 From slickrock slabs that will make you think you're on Mars, to The Whole Enchilada, Moab is a legend in the mountian bike world for a reason. Come ride with us to discover it for yourself. High-end demo bikes are included in your trip package. If you prefer to bring your own bike, we can offer a $150 discount off your trip -- please make sure it's in tip-top shape before you arrive. If you're traveling through Denver, you can stop at the evo Denver bike shop for any last minute needs! As for gear and clothing, Moab is located in a high desert climate. This means temperatures can range from very warm to very cold, be ready for both extremes on and off the trail. Yes, based on availability. If you have a roommate request, please let us know. By default, we will place two people of the same gender per room with two beds. Single occupancy rooms may be available at an additional cost of $350. Please check in with Customer Care before booking if this will determine your participation. The technical ability: This trip is for those who have been riding consistently for three+ years and consider themselves technically 'advanced’ - in other words, comfortable and confident on mildly technical terrain. We won't be focusing on the hardest trails but instead the best trails. There will be man-made bridges; some you will ride and others you might walk. The beauty of the trip is that you will get to ride with born and bred locals and most days you have the option to add on some trails. The fitness level: The days are all a little bit different, our shortest day is about 11 miles with a 1,800-foot climb. You should be able to ride four-six hours per day for four consecutive days. You can find a complete gear list above. 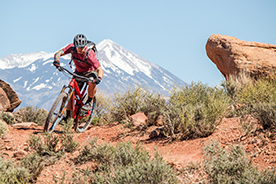 You will be responsible your own airfare for the trip, transfer to / from Moab, as well as any costs associated with transferring your bicycle, if you opt to bring your own. Travel insurance is also not included, and is highly recommended to cover you if you are forced to cancel your trip, or if you need to cover medical assistance, emergency transport, and/or theft or accidental damage while traveling. This trip includes 3 nights of lodging, 4 days of guiding from local professionals, high-end demo bikes, and all meals. Transportation during the duration of the trip is also provided, along with ride nutrition from Skratch Labs and Clif Bar, evo gear bundle, and 20% discount code from evo.com.. I'm ready to book, do I pay the full amount now? Yes, in line with Chasing Epic's policy, the full amount is due at time of booking. For all dietary restrictions, please let Chasing Epic know prior to the trip and they will accommodate you. We also recommend that you bring snacks, especially for full-day rides. Chasing Epic will send out an itinerary about a week prior to your arrival with more information on where and when to meet as a group on Day One. For our 4-day trips, we like to leave plenty of time for a good first-day ride, so plan on meeting around 1:00pm. If you need hotel recommendations for the night before, you can email Chasing Epic directly. For departure plans, expect to be finished with the trip by 2:00pm on the last day. We’ll still hammer out a good ride that day, so you’ll be tired! Is there a maximum number of customers on each trip? Yes, all trips are limited to 12 customers. If a trip has reached the maximum number of bookings, please contact evo Customer Care with your party size and we’ll see what we can do to accommodate you, possibly on another departure date. For liability reasons if you’re traveling alone, all customers must be at least 18 years old. If you’re coming on a trip with your parent or legal guardian, then you have to be 15 years old. What kind of accommodations will we be staying in? We understand the need for clean, comfortable lodging after a long ride and we love the idea of community. Therefore, a majority of the time we’ll be staying in very nice condos or townhomes, with one designated as the central gathering place for meals, hanging out, and apres-activities. In some locations that’s not possible, so we’ll stay in spacious hotel rooms and will have a large community space for meals and post-ride activities. All breakfasts and dinners are included in your trip: from dinner on the first night to breakfast on the last day. We will either go out to dinner/breakfast as a group, or we will have the meal catered at the house or condo. Alcohol is not included other than a post-ride beer, you’re responsible for your own alcohol/liquor tab at all restaurants. For our full day rides (typically days 2 & 3), we recommend packing in the calories with the energy bars, gels, and mixes. Please plan ahead if you want something other than a basic sandwich or wrap. What kind of demo bikes are available? Is everyone guaranteed a bike? Yes, we have high-end demo bikes included with each one of our booked Chasing Epic trips. And not just any demo bikes: we carry some of the most fun, cutting-edge bikes on the market today. We have both 29″ and 27.5″ bikes along with mid-travel and long-travel; basically something to suit any type of rider, for any type of riding. All of our bikes have carbon frames and very high-level build groups. I want to bring my own bike. Will I get a discount? We understand that some of our customers, want to ride their own bikes instead of our incredible demos. Not a problem! For customers not utilizing our demo fleet, we offer a small discount on the price of your trip: $150 off our 4-day trip price. To take advantage of this discount, please note at time of booking and Customer Care will add the discount to your order.